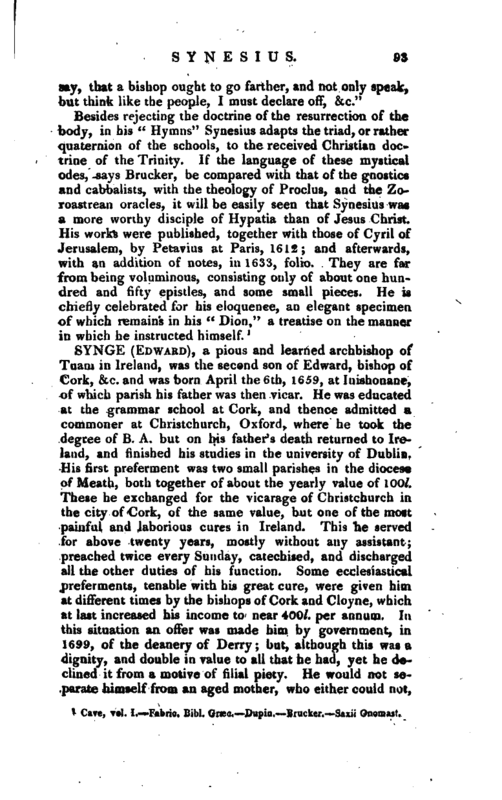 , an ancient fathei: and bishop of the Christian church, flourished at the beginning of the fifth century. 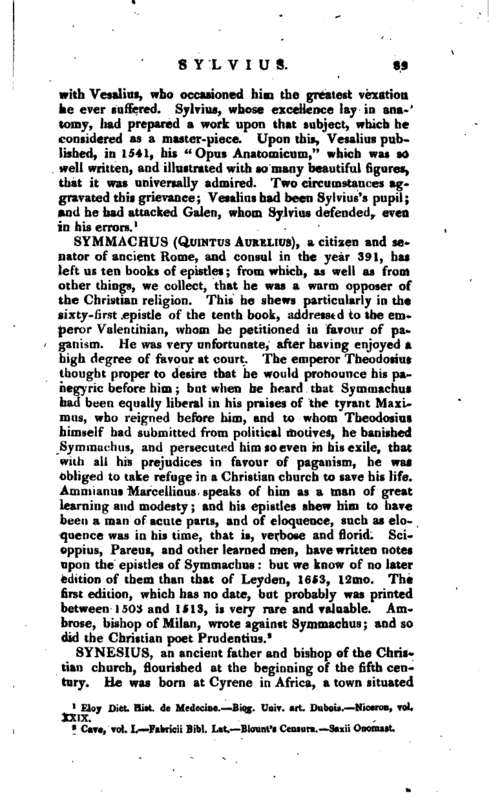 He was born at Cyrene in Africa, a town situated | upon the borders of Egypt, and afterwards travelled to th neighbouring country for improvement, where he happily succeeded in his studies under the celebrated female philo-r sopher Hypatia, who presided at that time over the Platonic school at Alexandria, where also the eminent mathematicians Theon, Pappus, and Hero taught. 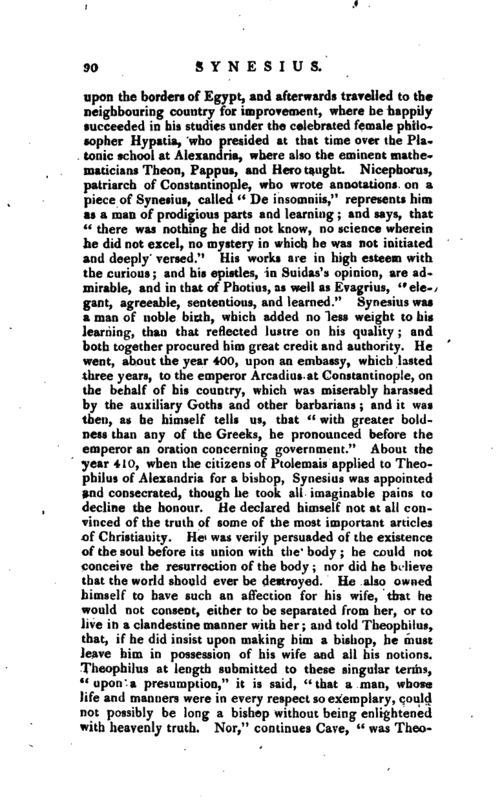 Nicephorus, patriarch of Constantinople, who wrote annotations on a piece of Synesius, called “De insomniis,” represents him as a man of prodigious parts and learning and says, that “there was nothing he did not know, no science wherein he did not excel, no mystery in which he was not initiated and deeply versed.” His works are in high esteem with the curious; and his epistles, in Suidas’s opinion, are admirable, and in that of Photius, as well as Evagrius, “elegant, agreeable, sententious, and learned.' 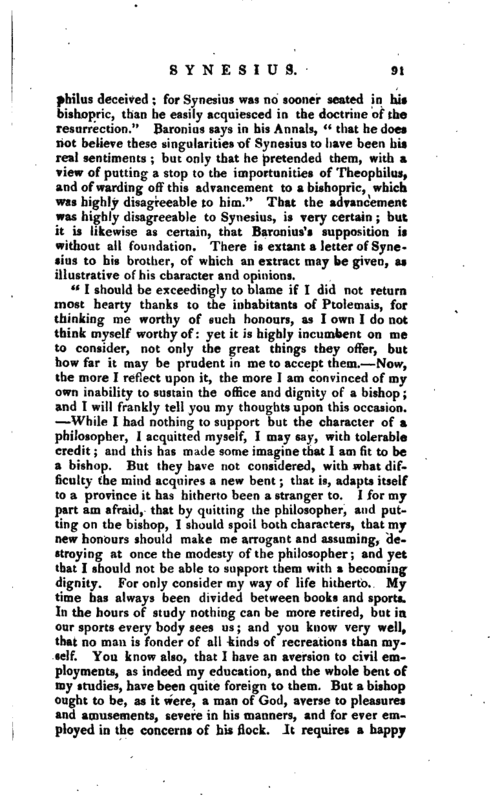 1 Synesius was a man of noble birth, which added no less weight to his learning, than that reflected lustre on his quality; and both together procured him great credit and authority. He went, about the year 400, upon an embassy, which lasted three years, to the emperor Arcadius at Constantinople, on the behalf of his country, which was miserably harassed by the auxiliary Goths and other barbarians; and it was then, as he himself tells \is, that” with greater boldness than any of the Greeks, he pronounced before the emperor an oration concerning government.“About the year 410, when the citizens of Ptolemais applied to Theophilus of Alexandria for a bishop, Synesius was appointed and consecrated, though he took all imaginable pains to decline the honour. He declared himself not at all convinced of the truth of some of the most important articles of Christianity. He was verily persuaded of the existence of the soul before its union with the body; he could not^ conceive the resurrection of the body; nor did he believe that the world should ever be destroyed. He also owned himself to have such an affection for his wife, that he would not consent, either to be separated from her, or to Jive in a clandestine manner with her; and told Theophilus, that, if he did insist upon making him a bishop, he must leave him in possession of his wife and all his notions. Theophilus at length submitted to these singular terms,” upon a presumption,“it is said,” that a man, whose life and manners were in every respect so exemplary, could not possibly be long a bishop without being enlightened with heavenly truth. Nor,“continues Cave,” was | Theophilus deceived; for Synesius was no sooner seated in hit bishopric, than he easily acquiesced in the doctrine of the resurrection.“Baronius says in his Annals,” that he does not believe these singularities of Synesius to have been his real sentiments; but only that he pretended them, with a view of putting a stop to the importunities of Theophilus, and of warding off this advancement to a bishopric, which was highly disagreeable to him." That the advancement was highly disagreeable to Synesius, is very certain; but it is likewise as certain, that Baronius’s supposition is without all foundation. 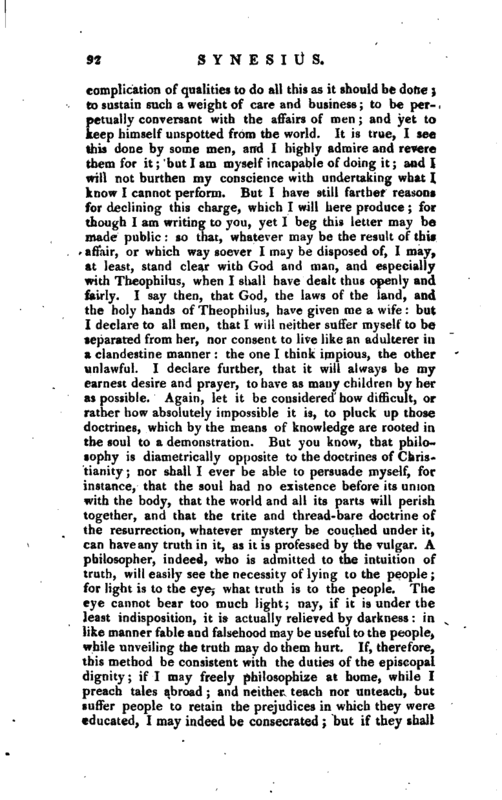 There is extant a letter of Synesius to his brother, of which an extract may be given, as illustrative of his character and opinions. Cave, vol. I.—Fabric. Bibl. Græc.—Dupin.—Brucker.—Saxii Onomast.